The Passenger Evacuation Seminar will present the work of the SAFEGUARD project, which has undertaken a series of full-scale ship passenger evacuation trials to gather data for calibration and validation of ship based evacuation simulation models. The International Maritime Organisation (IMO) under SOLAS Chapter III Regulation 21.1.4 requires that all survival craft shall be capable of being launched with their full complement of persons within a period of 30 minutes from the time the abandon ship signal is given. However, this regulation stipulates that the 30 minute timeframe only starts when all the passengers have been mustered with lifejackets donned. The guidelines require passenger ships evacuation to be assessed by computational means during the design phase to provide information on the duration of evacuation, passenger flows throughout the ship and to identify and, as far as practicable, eliminate areas of congestion. The guidelines provide for the possibility of undertaking either a simplified or a more advanced passenger ship evacuation analysis method. It specifies a minimum of four passenger evacuation cases to be considered; modelling full passenger ship evacuation during the day and at night and another case involving just one of the main vertical fire zones but assuming that only 50% of the stairways are available or than an additional 50% of the passengers from a neighbouring zone are forced to move into the zone to proceed to the assembly point also during the day and at night. The IMO Maritime Safety Committee asked the Sub-Committee on Fire Protection to develop guidelines for passenger ship evacuations in general. The resulting MSC Circ 1033 was always intended as an interim guideline. Much of the data for this circular was derived from the measurement of the movement of people in building on land. While there are many physical similarities there are also a number of the human and operational differences for a passenger ship evacuation. The evacuation procedure for a building would normally require the occupants to just head for the nearest exit points. Passing thought the external exit point would be the end of the evacuation process. On a ship the procedures are more complex. Passengers may have to return to their cabins to collect lifejackets before heading for a pre-defined assembly (or muster) station. They must then exit the ship via very unfamiliar methods such as getting to lifeboats, life raft and possibly evacuation slides. They face possible additional hazards due to weather exposure, vessel motion or even increasing vessel trim or list. Routes may be complex requiring passengers to travel up or down to decks from their current location or go to a specific side of the vessel (port or starboard). Passenger response time data is fundamental to ship based evacuation analysis and is a key parameter specified in the evacuation analysis protocol. 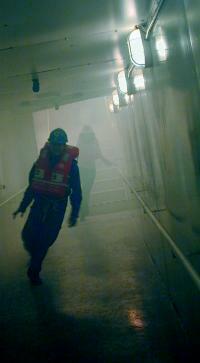 The European Union (EU) FIRE EXIT project undertook sea trials data relating to passenger ship evacuation response times, while limited it demonstrated that the response time data used in MSC Circ 1033 was not rich enough to accurately represent reality and as such did not provide a suitable basis either for the use of evacuation simulation programs or for their validation. The FIRE EXIT data from the SHEBA ship evacuation tests relating to passenger response times was submitted to IMO and incorporated within the new analysis protocol MCS Cir 1238. The main objective of the SAFEGUARD research project is to continue this work and acquire a large body of real ship based data on passenger response times and assembly times of a sufficient size and richness to permit calibration, verification and validation of passenger ship evacuation analysis software. The data from these trials along with additional benchmark scenarios will be reported to IMO in three information papers for possible incorporation into future modifications of MSC Circ 1238.